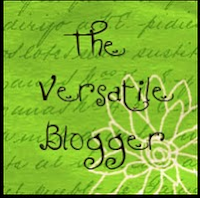 After enjoying a wonderful week off with my family, I returned to my blog and saw that Kristin at A Teeny Tiny Teacher had awarded me The Versatile Blogger award. I am so flattered. Too cool! This award comes with three rules. 1) Thank the person who gave it to you and link back to them in your post. 2) Share 7 things about yourself. 3) Pass this award on to 15 recently discovered blogs. 1. I am NOT a morning person. My mom used to have a sign in her room that said "there ought to be a better way to start your day than getting up in the morning." I totally agree. After I've been up about 30 minutes everything is good, but until then...watch out. I am a grumpy person for those first 30 minutes. 2. I love the way coffee smells, but I hate the way it tastes. A teacher needs her caffeine, but coffee just doesn't work for me. I love a good cup of tea or a diet coke. 3. I love pretty much anything to do with water. I love baths, swimming, boating, snorkeling, scuba.... You get the picture. I love water. In fact I spent the day at the beach/lake. The only problem is I am pale, pale, pale. So, as always, I brought the sunscreen. I brought factor 70 to be exact. The problem....well...I made a point of packing sunscreen, but I forgot to put it on and now I am sunburned. The worst part is my daughter is too. Oops! I guess I will be applying aloe tonight. At least it isn't a bad one. 4. In addition to blogging, making things for my TPT store, and planning activities for my classroom, I love to create hair bows. My daughter has a TON of hair bows, but I keep making more. I like making jewelry, painting, and doing lots of crafts, but hair bows are my current go to craft project. They are quick and easy. Plus, they are super cute and get used. Love them! 5. I am a fairly smart person, but there are two subjects about which I know next to nothing. The first is cars. I do have jumper cables and the equipment for a tire change in my car. I also have a first aid kit. However, I have never changed a tire and never jump started a car. I have had at least three flat tires. Each time I have started to change the tire (using my car manual's directions). Each time someone else has finished it and I have been very grateful. The second subject that I know nothing about is famous people in pop culture. I seriously thought Brad Pitt was a new student at my school when he first became famous. My friends kept saying he was cute and I finally asked them to show me the new kid. They brought in some magazines and held an "intervention." Of course, that was after they stopped laughing. 7. I got engaged when I was 18, but I refused to get married till I finished college. I took 18 to 20 hours every semester and at least 12 during the summers. During that time, I studied abroad twice (once was during September 11th and I came home early). I finished in 3 years and got married 5 days after graduation. We will be celebrating 10 years in May. Now, I'd love to share the love and pass on the Versatile Blogger Award to 15 blogs. I hope you these haven't already gotten it, but if so they deserve it twice. These are some blogs I've recently discovered and a few old favorites mixed in. I haven't been online much this week. My Google Reader had 500 posts to read when I looked at it today! Yikes! If you are wondering why I haven't been around much, it is because I have been too busy getting ready for family visits and then enjoying their visits. I have been enjoying a fabulous week off with my family. We had family visiting from North Carolina and England. We have had a ton of fun. My daughter met her grandpa and his wife from England for the first time and got to see her little cousin and aunt from North Carolina. We all went to the Georgia Aquarium and watched the awesome dolphin show. My daughter and I love the dolphin show. She got her face painted like a unicorn. The picture doesn't do the painting justice. We also went to the Cabbage Patch Hospital where we looked at all the babies and then picked a cheaper one at the gift shop. Do you remember them? Other places we went this week were the fair, apple orchards, etc... It was a busy week, but we had a ton of fun. Anyway, now I am back. I can't wait to read all the posts on my Google Reader and get back to my blogging. I've missed it. I have been looking for materials to use on Friday for Constitution Day. I didn't find much that was suited to first grade. I did find a few things, but not as much as I would have thought would be available for such an important topic. So, I made a few things to use and I thought I would share them with you. I made letters for and a worksheet for students to build words with. I also wrote a little book to use to open our discussion of the constitution. I am planing to follow the book with the Liberty Kids episode, "We the People." After the discussion, we will create an anchor chart as a class that the students can use to complete their own graphic organizer and writing. I will also probably have the students make a flag. You can download the materials I made here. Enjoy! If you have any materials you would like to suggest related to Constitution Day, please leave a comment below. I would love to find some more resources. Thanks! 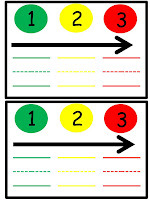 I have been making comprehension games for the first unit of the first grade Reading Street. 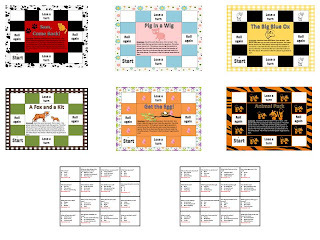 These are partner games that focus on comprehension skills for the weekly story. I love them because they are fun and motivating for my students and they help my students prepare for their weekly test. The kids win because they get to play a game and I win because they get some extra practice. Love it! Unit 1 is available on TPT and includes six games for just $1.50. Unit 2 will be posted tomorrow! Today is International Literacy Day. So, I wanted to share a free file too. These are segmenting tools. You can use them to help students learn to sound out words. The students says the word or syllable they need to spell. It it is a multiple syllable word the student should sound out one syllable at a time. Then he or she points to each circle saying the sound and writes the letter or letters making the sound below it. I laminated them and use them with dry erase crayons. This strategy has helped my students who could'nt segment learn how. 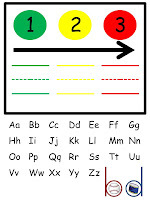 I have been using them at home with my four year old too and she is now sounding out CVC words. It's made a big difference. For more fabulous posts on literacy stop by The Lesson Cloud. Today has been interesting here with the tornadoes. Thankfully, they missed my house and we have power. Once the storms passed and I could catch up on my blog reading, I learned two bloggers had given me the Top 10 Award. Thank you. They both have fabulous blogs, which are totally worth following. So, check out Plug-n-Plan and Kinder Fun. Here are my top 10 in no particular order.